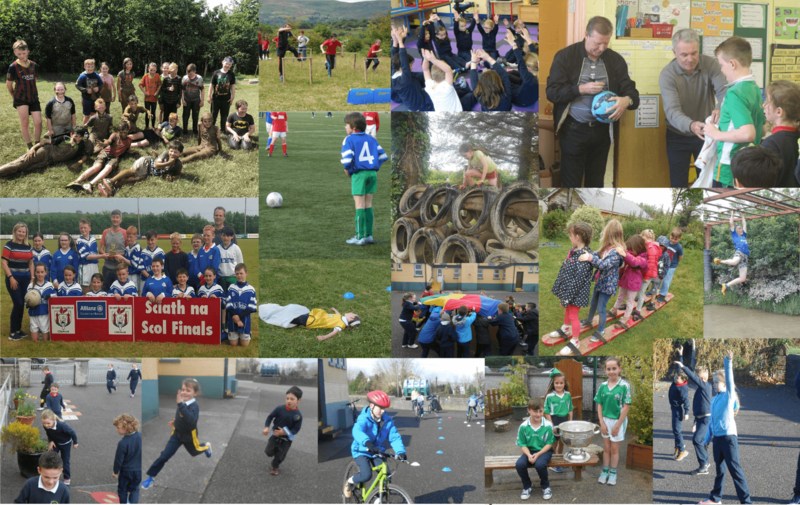 Physical Activity » TOGHER N.S. Physical Activity is the promotion and engagement of exercise and movement in addition to the 60 minute per week timetabled curriculum subject of Physical Education. Togher N.S actively promotes the message that children require 60 minutes of moderate to vigorous physical activity every day. In Togher N.S we have been extremely busy as we have engaged in a wide variety of different programmes, ideas and initiatives which have inspired the children to become more active. Togher N.S promotes the full range of fundamental movement skills during break times and pupils are encouraged to run, play and to do ‘talking as you’re walking’. We have two daily playground breaks and our school yard is zoned to allow children to engage in a variety of different activities. Our school has playground leaders who set up activities and sports equipment during break times for others to use. All pupils engage in an extended classroom based physical activity break on wet days and short physical activity breaks during the day – Active Walkway, Drop Everything And Run, Movement Breaks, Go Noodle, Super Troopers, Irish Dance etc. Our school incorporates physical activity into school calendar events as we hold different seasonal activities and events – Easter Egg Hunt, St. Patrick’s Day Parade, Monsters Ball, Dancing with Rudolf etc. Check out our Active School blog posts by clicking on the image below.